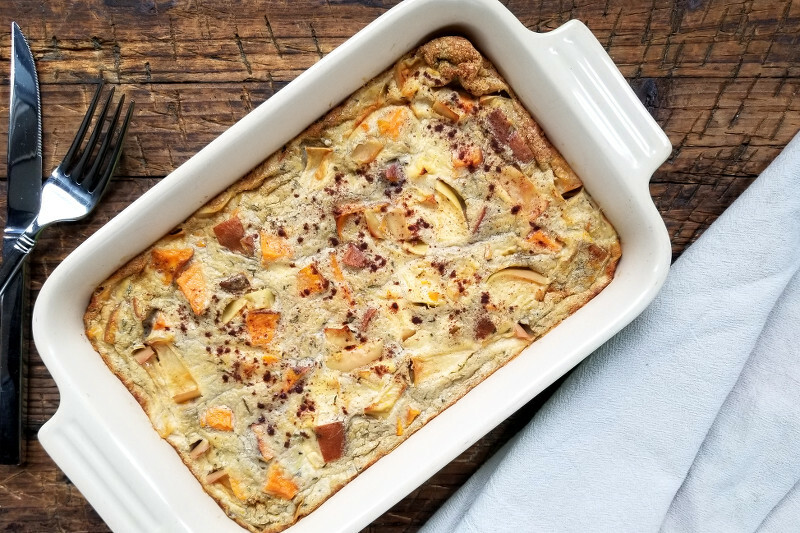 Paleo & Whole 30 Apple Sweet Potato "Bread Pudding"
I had the idea for this recipe circulating in my head for a while and I am SO glad I finally made it. Yum. Slightly sweet with custard-like egg filling, this has become my go-to breakfast for the week. It’s also paleo, Whole30 compliant and gluten free as always – but if you’re feeding a crowd all that matters is it’s good! 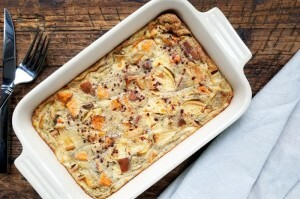 The recipe makes a large baking dish worth (about 8-10 servings) so you can prep it ahead and enjoy it for days. I’d also argue this makes a great afternoon snack – a kick of protein and carbs with some healthy fats to power you through until dinner. In addition, if you want to get creative, bake this in muffin cups for an even easier way to take it on the go. Enjoy! Chop apples and sweets into 1 inch pieces. Roast apples with 1 Tbl coconut oil, pinch salt and half the cinnamon until "al dente" in texture, about 15 minutes. Roast sweets with 1 Tbl coconut oil, pinch salt, half cinnamon and the thyme, until "al dente" in texture, about 25-30 minutes. In a large bowl whisk a small amount of eggs with the arrowroot to form a paste, then slowly whisk in all the eggs, then coconut milk and salt. Add the roasted apple and sweet to the filling, then pour gently into greased baking dish. Sprinkle a pinch of extra cinnamon over the top. Bake until puffed and the center is firm to the touch, about 30 minutes. Baking time will vary slightly based on the size of your baking dish. I'm Grace, a chef and health coach whom, while on a mission to live a healthy life, also hopes to transform the lives of others. I follow principles of real food eating, with a mind for health and sustainability. I emphasize food that is nutrient dense, reduces inflammation and promotes healing in your body. My hope is to share recipes and resources with you all so that you too may find a healthy way of life. I am well versed with diets that eliminate potentially problematic or allergenic foods: gluten-free, dairy-free, grain-free, autoimmune protocol and low-fodmap. If you're feeling overwhelmed by one of these protocols, I bet I can help!